For nearly 5 hours in a federal courthouse on Feb. 1, 2019, Net Neutrality advocates and critics traded arguments in the case of Mozilla Corp. v. FCC over the Federal Communications Commission's (FCC) 2017 decision to rescind Net Neutrality rules. EBSCO Information Services acquired Stacks, whose platform was released in partnership with EBSCO in 2016. This hosted content management system for libraries simplifies content creation, enables the marketing of library programs and services, and facilitates conducting surveys and polls, among other tasks. CLOCKSS partnered with 11 more publishers to preserve their digital content for the future, including the American Dental Hygienists' Association (ADHA), the Canadian Dental Association, Georgia Southern University, IntechOpen, iScience Notes, Quantum Publishing, and Spandidos Publications. All books and journals from the Peter Lang Publishing Group, which specializes in the humanities and social sciences, are now discoverable via the Yewno Discover platform. Alexis C. Madrigal writes for The Atlantic, "The past three years have seen a new Amazon emerge as the company's physical footprint balloons." 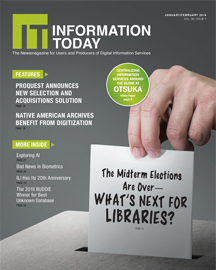 Adam Rowe writes for Forbes about a new study from Ithaka S+R, "Library Acquisition Patterns."